Atlantic tarpon (Megalops atlanticus; Figure 1) are a popular recreational sport fish in the Gulf of Mexico as well as the sub-tropical and tropical Atlantic Ocean. Anglers love the athletic challenge of reeling in adult Atlantic tarpon, which can reach over 200 lbs. 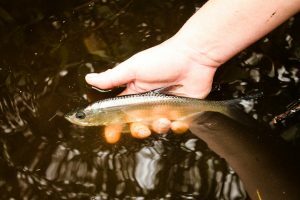 However, in order to reach epic proportions, juvenile Atlantic tarpon (Figures 2 & 3) need the protection and food resources found in crucial nursery habitats such as back-bays, tidal creeks, mangroves and wetlands. High demand for coastal real estate in Florida has resulted in a dramatic reduction of Atlantic tarpon nurseries. However, despite the importance of Atlantic tarpon in Florida, almost no information is available regarding these nursery habitats to allow for estimations of habitat loss and degradation. This is especially concerning given that almost 80% of the human population of Florida lives in coastal regions which has led to the loss of an estimated 44% of wetlands in Florida. 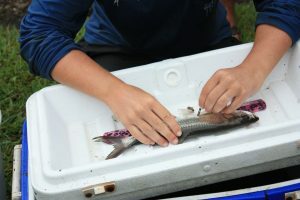 JoEllen Wilson, Aaron Adams and Robert Ahrens from the Bonefish & Tarpon Trust, Florida Atlantic University and the University of Florida, decided to enlist the help of anglers to improve juvenile Atlantic tarpon habitat in Florida. To identify juvenile Atlantic tarpon habitat in Florida, the researchers used social media, print media and presentations at fishing clubs to reach out to fishing guides and anglers and ask them to report juvenile Atlantic tarpon locations. Sites were considered nursery habitat if they were known to have been visited by Atlantic tarpon less than 30 cm long and the anglers had visited these sites within the last two years. Anglers classified the sites as either natural or altered and the sites were subsequently transcribed into a database. Altered habitat was identified when it was visibly altered from its original state. In Florida, altered habitat typically includes mosquito control impoundments, retention ponds, golf courses, drainage ditch networks, dredging and mangrove removal. These habitat alterations lead to changes in habitat that often have negative effects on juvenile Atlantic tarpon including lower growth and survival. To characterize the nursery habitat identified by anglers in more detail, the researchers used geographic information system (GIS) software and field observations to confirm what the anglers were reporting. Overall, Wilson, Adams and Ahrens successfully used citizen science to identify juvenile tarpon habitat as altered or natural, with anglers accurately assessing 26 of 31 sites (84% accuracy). The researchers showed that citizen science can be an effective method in identifying juvenile Atlantic tarpon habitat and providing current characterizations of the nursery habitats. This approach has the possibility to be used across Florida and the rest of the Atlantic tarpon’s range. Other species including Common snook (Centropomus undecimalis), Permit (Trachinotus falcatus) and Bonefish (Albula vulpes) also rely on coastal habitat and could benefit from data provided by anglers. Citizen science is an effective way to engage the angling community and others in science while allowing researchers to acquire data that may be lacking. Identifying nurseries of low quality will help focus habitat restoration efforts for juvenile Atlantic tarpon while engaging important stakeholders (anglers!) in the science. Wilson, JoEllen K., Aaron J. Adams, and Robert N.M. Ahrens. 2019. 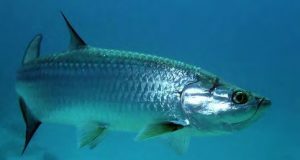 Atlantic tarpon (Megalops atlanticus) nursery habitats: evaluation of habitat quality and broad-scale habitat identification. Environmental Biology of Fishes 102(2):383-402. Previous story Some corals can acclimate to warmer ocean temperatures over the long-term, but can they keep pace with the rate of global warming?